Nicky Knoff is teaching some of her final workshops in Australia now at the Ashtanga Yoga Centre of Melbourne, before she relocates to USA. Senior Yogi Nicky Knoff is soon to move to the USA, meaning her current workshops at our Centre will be some of her last in Australia. While the US yoga community will gain from this change, Australia will lose a much loved and respected yogi. 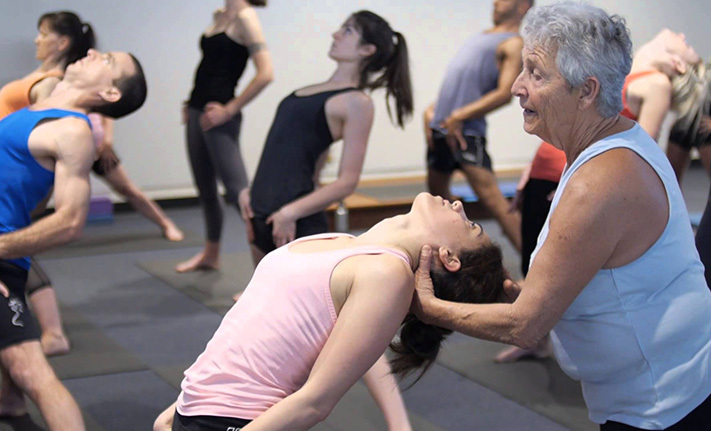 Nicky — whose knowledge is distilled over 40 years of study — is considered by many as one of the greatest yogis of our time. Nicky is a 4th-Series Ashtanga-Vinyasa Yoga Practitioner, Certified Senior-Iyengar Yoga Teacher, Certified College-of-India Teacher with Bikram Choudhury, Long-Term Vipassana meditator, WWII-concentration-camp survivor, and founder of six yoga schools in New Zealand, Australia and America. Students at our Centre were treated to a special talk from Nicky last Friday night. Nicky’s final workshop is this weekend. – book here. Interview & video courtesy of Darius Devas of Being Films, who is also a dedicated regular at our Centre, and Lucas Maddock.